Blogging: Six Words at a Time! 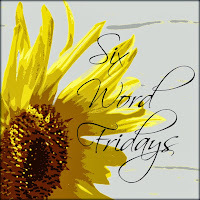 I am thrilled to host SIX WORD FRIDAYS! Started by the lovely and talented Melissa Camera Wilkins and handed on to me, this has been one of my favorite blogging link ups! I hope you'll help me carry on this Friday tradition in grand style! Adrienne, I know you'll do a wonderful job at hosting Six Word Fridays! I haven't participated but a few times, but maybe I'll be a little more motivated. Oh - and I entered my e-mail address and clicked "subscribe", but I received an error message. Just thought you'd like to know. Thanks for sharing those past examples of great Six Word Fridays posts. I have signed up for the new season. Hi Adrienne! I participated rather inconsistently with this since the beginning of the year, but have signed up and will do as I have time. Thanks for taking it over! I've always love Six Word Fridays! Supposedly I am subscribed and I know that I am linked back to Six Word Fridays but I never receive the emails and have to remember to go have a look. Are you able too fix this? I'm a little late to the party, but I can't wait to join in. Will there be a linky or do we just post a link to our images in the comments? I had to think about the six words but it came to me all at once. Sorry, I linked up with both Six Words and Nurture Photography. My life is on “hold” now. Events contrived to stall me cold. Where to from here? Who knows? I hold my breath, expectant, hopeful. How long can I hold on? I walked a labyrinth this morning. that led me into helpful thoughts. Hold fast! Be patient! Find purpose! Well the formatting messed up, so it doesn't appear as I wrote it with 6 words per line. Tell me how to make this work. Found this a day late this week, but will try to join in from now on. Looks like fun. I'm a little confused! I initially assumed each sentence of a story would need to be six words. With poems I thought it would be complete six word lines. But in your examples it appears that you just write whatever you want and shift down every sixth word which makes poems very difficult to read and stories rather odd! Or am I getting it wrong?